Validates their humanity in a professional setting. Proven to reduce stress by reducing cortisol levels that produce stress, anxiety, and depression. Increases oxytocin, serotonin and dopamine which enhance well being and relaxation. Engages the immune system to prompt the bodies response to negative emotions and pain. Enhances mental outlook and cognition. Standardized Procedure that allows access to healing touch in a controlled environment. Guided secure structures which include hand holding, sitting and standing hugs, gentle caresses on arms, shoulders, back, lightly stroking head and hair, and other trusted touch to uniquely support the client session. 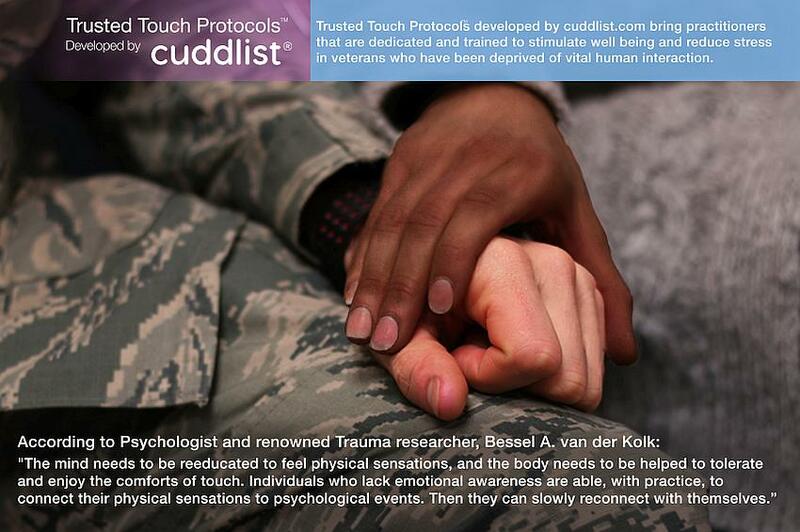 Cuddlist has been training the highest caliber of touch practitioners for over 2 years. Developed by a team of leading experts in collaboration with doctors.